Coach walks the wilder path less traveled with this Madison purse. Handbags emblazoned with tiger stripes and python scales are almost commonplace these days, so Coach takes its inspiration from the spots of the snow leopard! The result is a bag more sedate than many adopting animal prints. While most delight in colorful contrasts, here we see a more muted mix of black, gray, white, and silver. The Coach name is subtly nestled amongst the spots, a little nod to the brand but one that doesn't overwhelm the design. The appeal of this Madison hobo goes beyond its slightly slouchy good looks though. Playful purple satin lines the sizable interior, which is well appointed with two slip pouches for girly gadgets and a zip pocket for small valuables. It's a relatively roomy space, but not one that's unmanageably so. A collection of straps offers a couple of carrying options. In standard mode, the leather strap can easily fit over one shoulder. When you're on the go just add the longer strap and you've got a cross-body bag. I'd prefer the original strap was detachable for a cleaner look in cross-body mode, but it's a minor complaint. At $279 this purse isn't cheap, but the price tag isn't likely to startle Coach’s loyal fans. 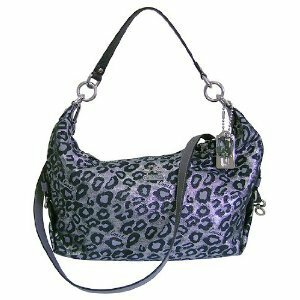 The Coach Madison Ocelot demi bag, a great alternative to this hobo bag.